The San Diego County Board of Supervisors asked staffers to come up with a tiered system to regulate beekeeping in unincorporated areas, and the dangers of Africanized bees was a factor in the decision. The supervisors, who proposed easing the regulations last October, set aside three options – to cut the current 600-foot setback requirement between bee hives and dwellings by half, by two-thirds or down to 15 feet. Those are similar to the city of San Diego’s rules and favored by many local beekeepers. The board voted unanimously in favor of developing a tiered ordinance designed to balance public safety and help local beekeepers stay afloat, along with encouraging the re-establishment of a less aggressive bee population. Chairwoman Dianne Jacob said the least restrictive option was “almost too lax,” and suggested that hives be kept 200 feet from dwellings and 100 feet from roadways, with tiered options to have that distance reduced further via permit or by meeting increased requirements, such as courses in responsible beekeeping. Entomologists contend the 15-foot option poses a higher risk to public safety because of the “unpredictable and overly defensive behavior” of Africanized honey bees, according to a county report. If fees are involved, Jacob suggested a sliding scale based on the number of hives kept on a property. County staffers said the number of beekeepers in unincorporated areas of the county far exceeded those in the city of San Diego and the risk of stinging incidents was significantly increased if bees were kept in closer proximity to residents, pets or other animals. In those areas, there also are fewer buildings where someone under attack can take shelter. Africanized honey bees comprise 80 percent of the wild hives in the county, and will defend a 150-foot perimeter around their hives, compared to 25 feet for the European variety, and their multiple stings can be fatal, according to the report. “Combating the Africanized bees is probably the nexus for any county ordinance,” Supervisor Bill Horn said. Kim Hamilton of the San Diego Beekeeping Society said Africanized bees took over in the Deerhorn Valley area following the 2007 wildfires, and a 600- foot setback requires 30 acres, which was limiting area residents from dealing with the feral bees. “The only way we’re going to have a shot at re-establishing a healthy population of domestic bees is to encourage it,” Hamilton said. 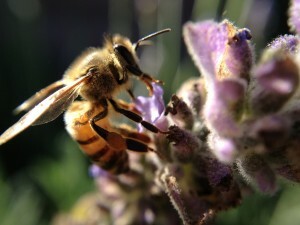 Bees not only produce honey but are important pollinators for agriculture. Nationwide, the industry has been hard-hit by a malady called Colony Collapse Disorder, which has no identified cause, according to the U.S. Department of Agriculture. Frank Golbeck of Fallbrook said the regulations should be revised so beekeeping is easier for hobbyists. “We have an opportunity here to bring the health of the honey bee back in our county for everyone’s benefit,” Golbeck said. County staffers were given eight months to a year to work with beekeepers and others to come up with a tiered system of less restrictive zoning rules.